The Comprehensive Wedding Budget is the best tool for planning your special day. You’ve been waiting for this moment your entire life, so you want every last detail to be perfect. 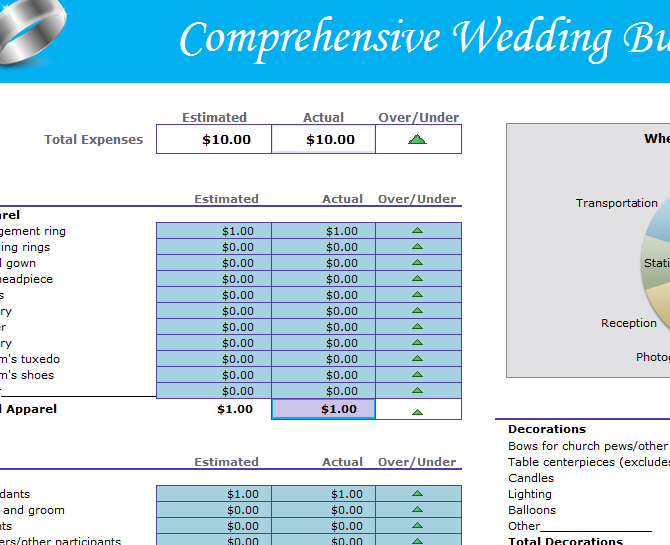 This comprehensive sheet has everything you need to neatly organize all of your expenses for the perfect wedding. Too many times wedding day plans fall apart due to unexpected financial problems. It’s easy to forget a small detail of your wedding since there are so many elements to plan in the first place. 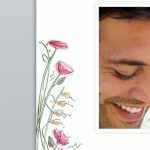 The first step to planning your dream wedding is to download the free file below, simply click the link provided at the bottom of the page. 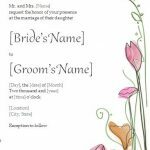 The template provides you with a generous amount of examples, but you can easily change these to something more befitting of your unique wedding. Simply click the item you want to change and start typing something new. You will notice that all the items are listed under a category for easy browsing. You can change the category titles as well by using the method mentioned above. Make sure to change the titles in the small chart below the budget sheet as well. This will keep the pie chart updated also. 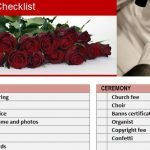 Once you have finished entering all the items you expect for your wedding, you can go through each section and start filling out the “Estimated” column and creating a budget for your entire wedding. When you have actually paid for the item or service, you can mark that figure under the “Actual” column. When the “Actual” and “Estimated” columns have been completely filled out, the template will automatically calculate the difference and indicate whether you are over or under the predetermined budget. All this information will also be relayed in the graph, illustrating which category is taking up the most money. Don’t sweat the finances when it comes to your dream wedding, this template has you covered! You shouldn’t have to sacrifice important aspects of your wedding just because you lost track of something small too close to the wedding day. With the template’s simple design and easy-to-read graph, you’ll know exactly where your money is being spent. 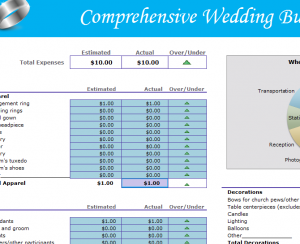 Plan the perfect wedding by downloading the free Wedding Budget template today!